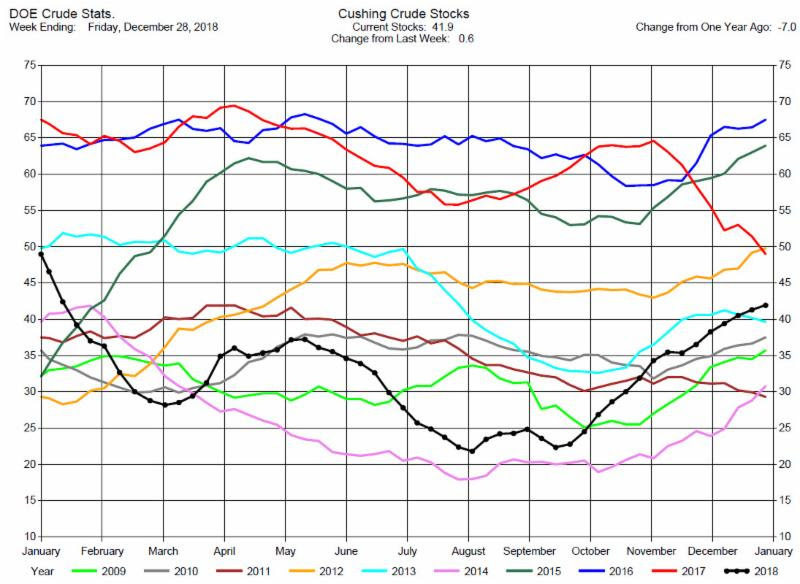 Crude Oil Stocks unchanged. Expectations were for a draw. 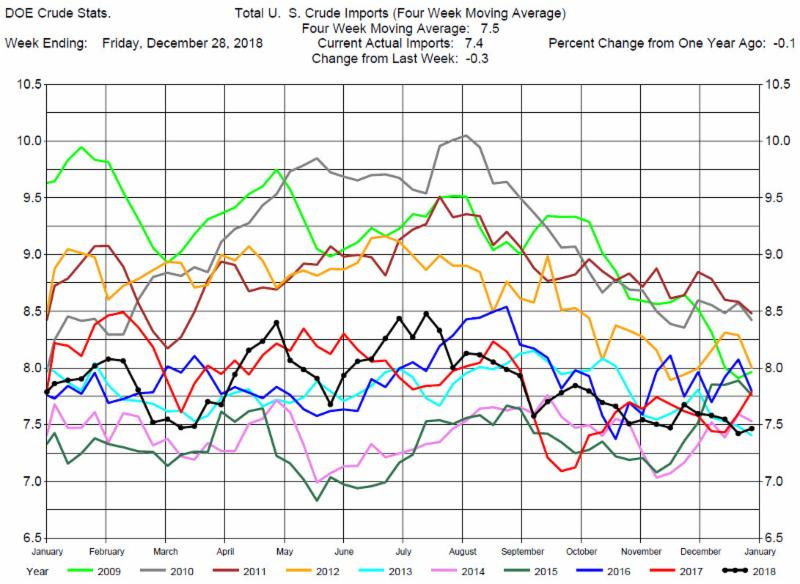 The DOE reported Total Crude Oil Inventories unchanged at 441.4 million barrels for the week ending December 28, 2018, while expectations average was for a 3.1 million barrel decrease. 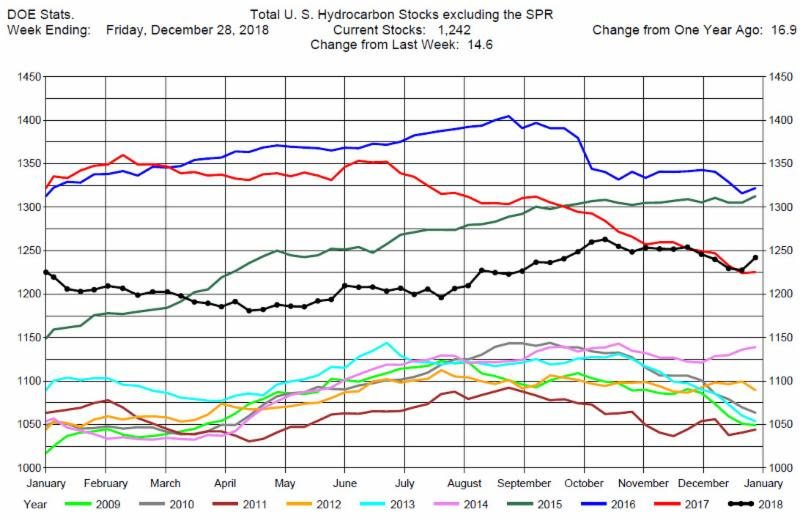 Overall hydrocarbon supplies increased by 14.6 million barrels to 1,242 million barrels. 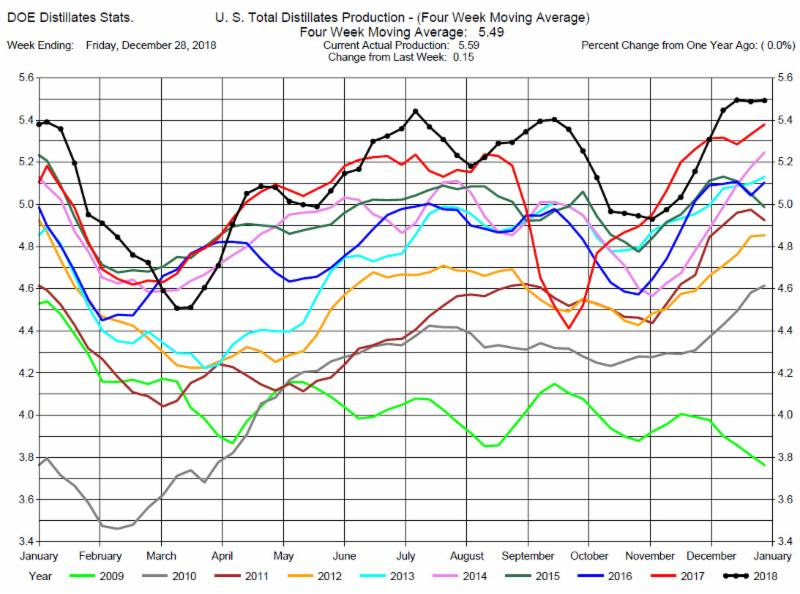 Crude Oil Production was unchanged at 11.6 million barrels per day. Total Crude Imports were 300,000 barrels per day at 7.4 million barrels per day. 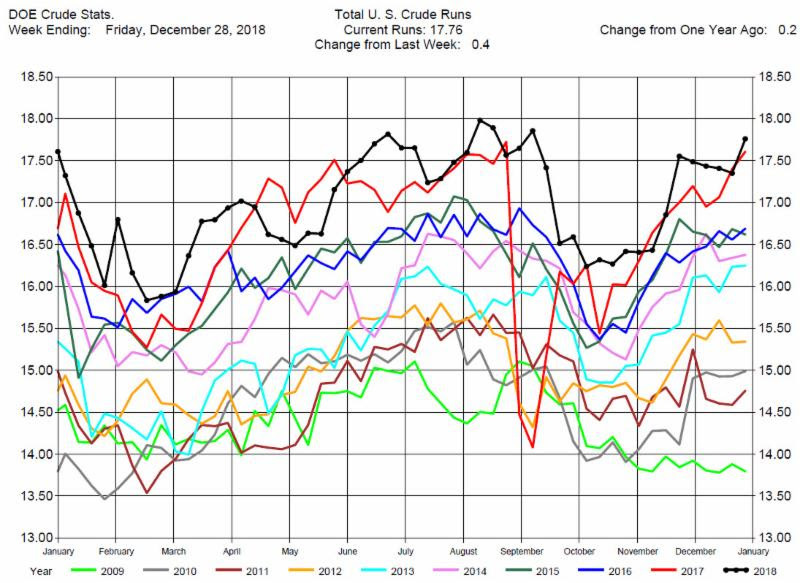 Total Refinery Crude Runs were up 400,000 barrels per day at 17.76 million barrels per day. The DOE report was bearish for crude oil prices. Prices were up $2 at the release of the report but then traded down, finishing up about $1.00 by the end of the trading day. Prices have rallied $6 from their lows in December with reports of the largest OPEC output cuts since 2017. Prices have also been supported by US and China trade talks which has reduced some fears of a global economic slowdown. For now we expect prices to be more affected by news headlines than fundamental supply/demand information. 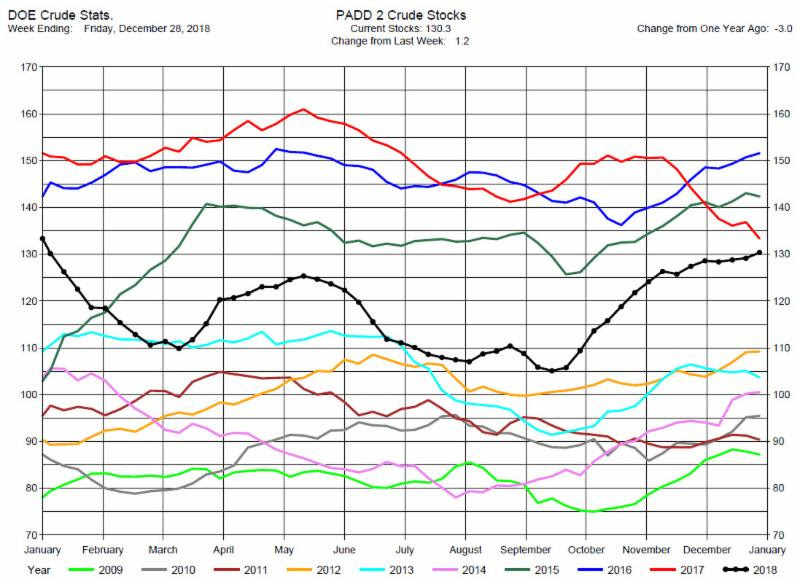 This means crude oil prices will continue to be volatile. 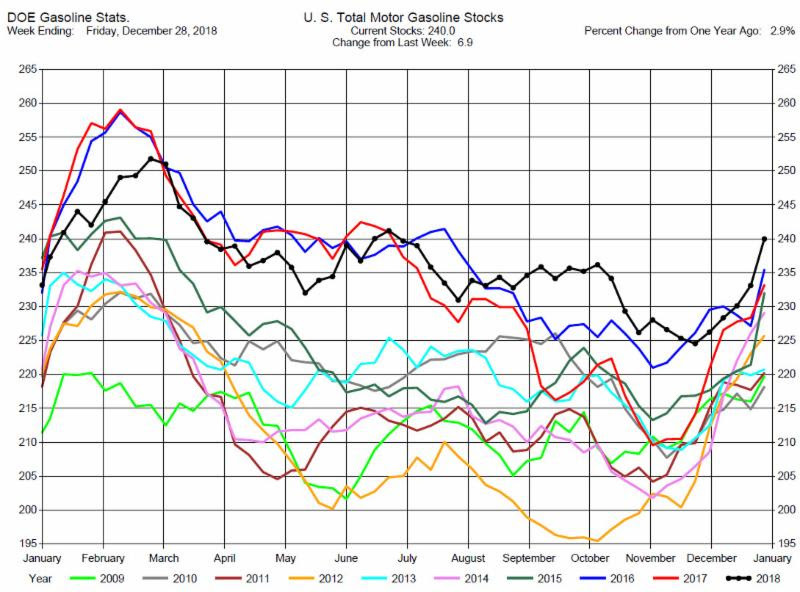 Gasoline Stocks Build, Much Greater than Expectations. 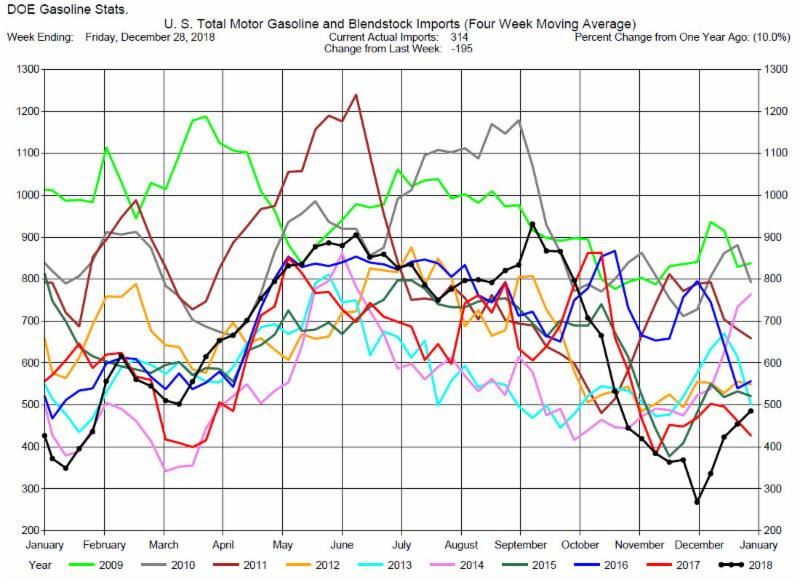 Total MotorGasoline Inventories increased by significant 6.9 million barrels to 240.0 million barrels for the week ending December 28, 2018. 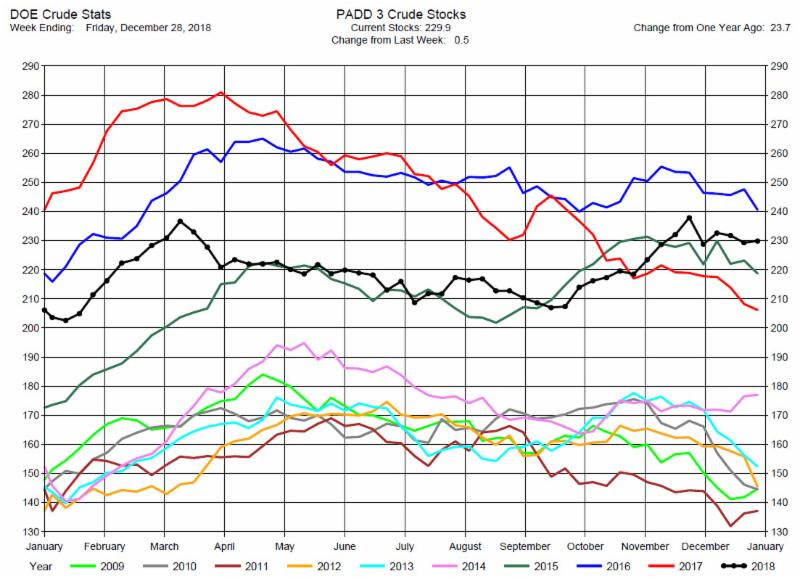 The expectations average was for a 2.0 million barrel increase. 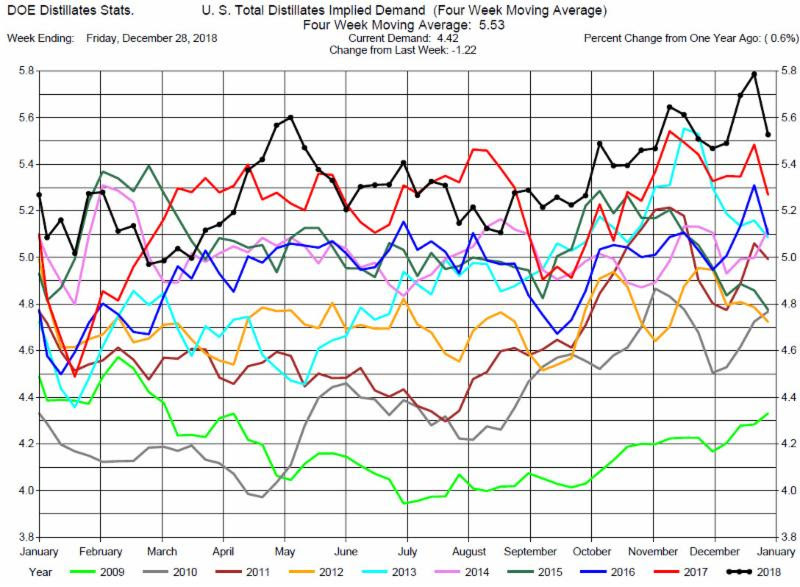 Implied Demand was down by 190,000 barrels per day to 8.86 million barrels per day. 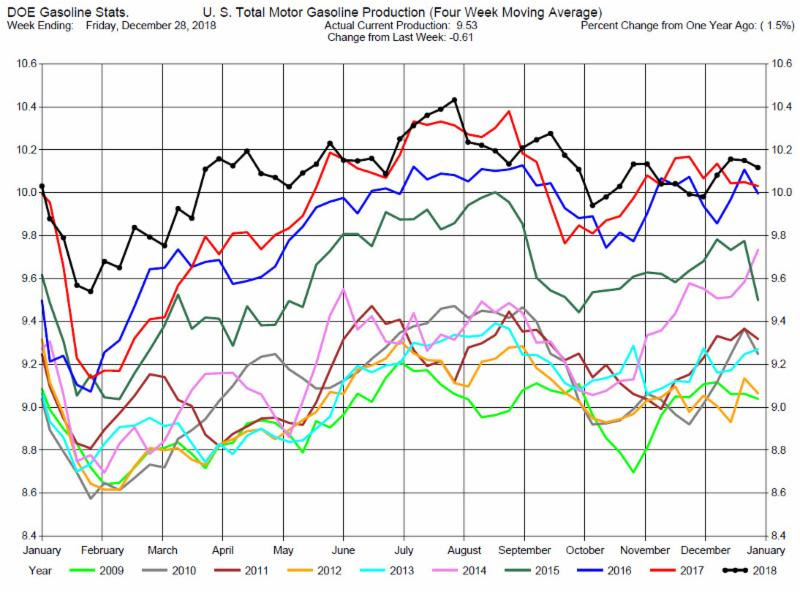 Gasoline Production was down 610,000 barrels per day to 9.13 million barrels per day. 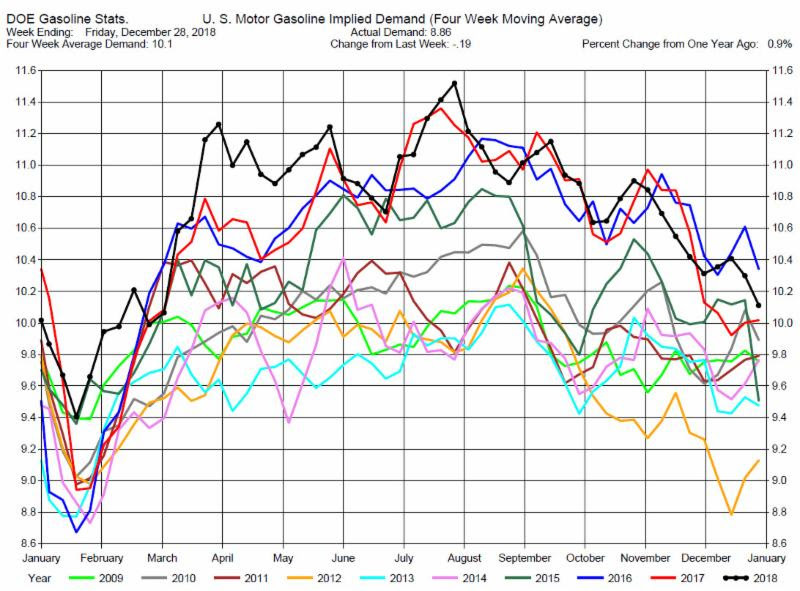 The DOE report was very bearish to gasoline prices. The prices tracked crude oil prices, up before the report release, trading down after the release, but still ending positive for the day. 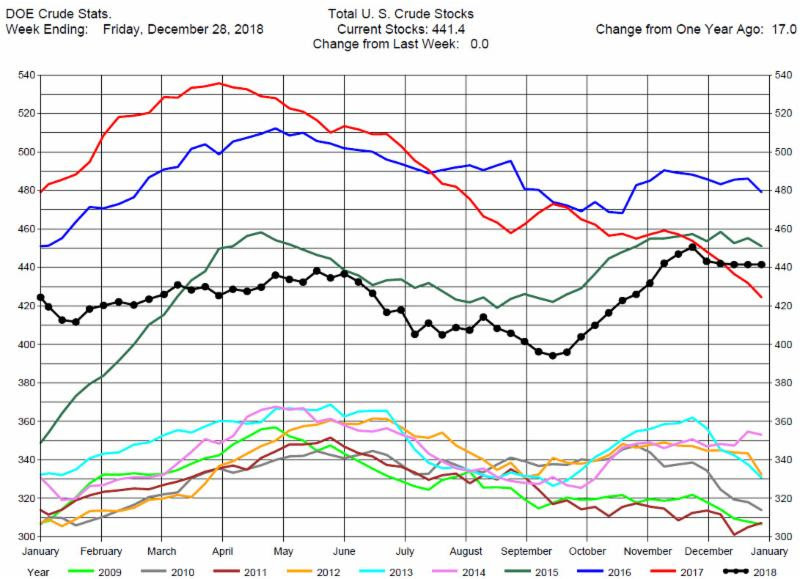 Total Distillates Stocks increased by large 9.5 million barrels to 129.4 million barrels for the week ending December 28, 2018, while expectations average was for a 1.6 million barrel build. 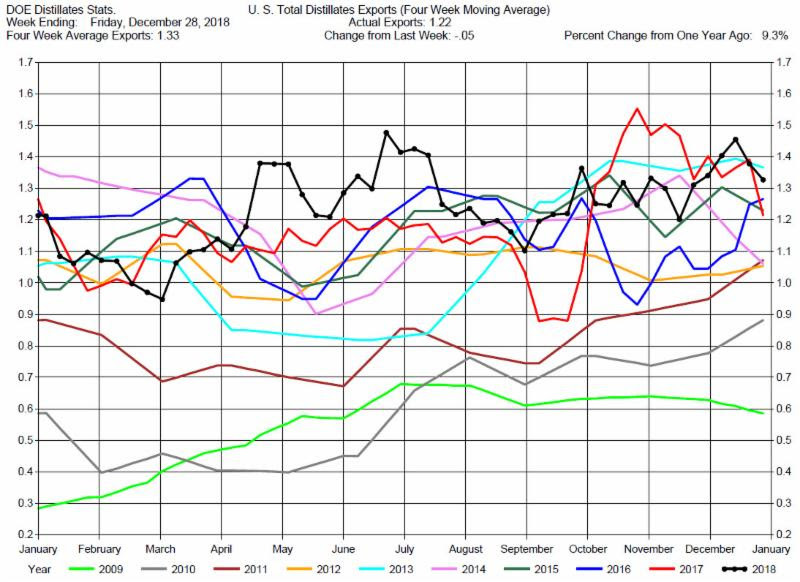 Total Distillates Production was up 150,000 barrels per day to 5.59 million barrels per day. 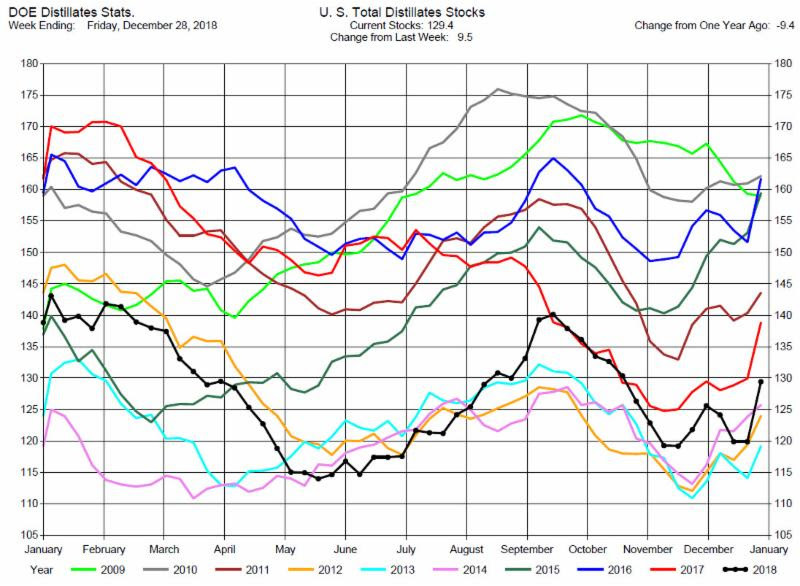 Total Distillates Implied Demand down by 1.22 million barrels per day at 4.42 million barrels per day. The DOE report was also very bearish to heating oil prices. The prices tracked crude oil prices, up before the report release, trading down after the release, but still ending positive for the day.